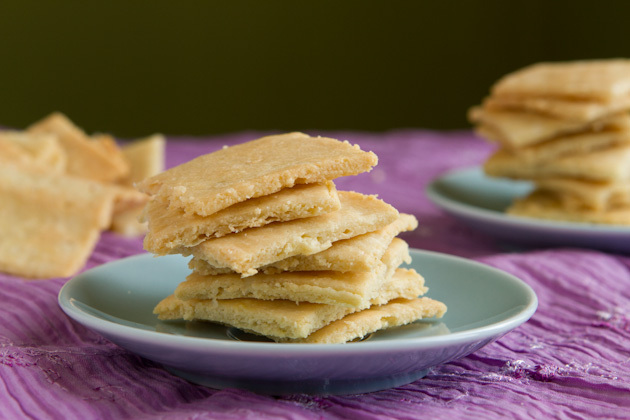 Crisp grain-free crackers made with sharp white cheddar and finely ground almond flour. Preheat your oven to 350F and set aside a large baking sheet. Combine almond flour, salt and baking soda in a medium-sized bowl. Whisk until combined completely. Add eggs and oil, stir to combine. Fold in shredded cheddar and knead with your hands until combined well. Dough should roll into a ball easily. Place dough on a large sheet of parchment. Fold the parchment over like a book and roll the dough out 1/4-inch thick. Remove the top layer of parchment and transfer rolled out dough to the prepared baking sheet. Score the rolled dough with a knife into 1-inch squares and place baking sheet in the preheated oven. 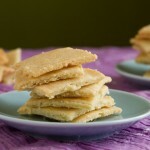 Bake for 12-15 minutes, remove from the oven, remove parchment and pull apart crackers. Lay them out onto the baking sheet and return back to the oven for an additional 3-5 minutes. Remove from the oven and allow to cool completely on the pan.